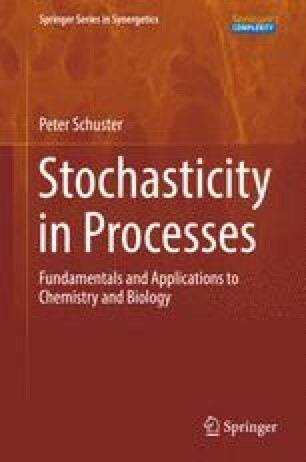 Stochastic processes are defined and grouped into different classes, their basic properties are listed and compared. The Chapman–Kolmogorov equation is introduced, transformed into a differential version, and used to classify the three major types of processes: (i) drift and (ii) diffusion with continuous sample paths, and (iii) jump processes which are essentially discontinuous. In pure form these prototypes are described by Liouville equations, stochastic diffusion equations, and master equations, respectively. The most popular and most frequently used continuous equation is the Fokker–Planck (FP) equation, which describes the evolution of a probability density by drift and diffusion. The pendant to FP equations on the discontinuous side are master equations which deal only with jump processes and represent the appropriate tool for modeling processes described by discrete variables. For technical reasons they are often difficult to handle unless population sizes are relatively small. Particular emphasis is laid on modeling conventional and anomalous diffusion processes. Stochastic differential equations (SDEs) model processes at the level of random variables by solving ordinary differential equations upon which a diffusion process, called a Wiener process, is superimposed. Ensembles of individual trajectories of SDEs are equivalent to time dependent probability densities described by Fokker–Planck equations. and with five I can make him wiggle his trunk. Enrico Fermi quoting John von Neumann 1953 .